Have fun and keep cool this mid-term at Aqua Park! Includes use of rubber rings and life jackets. Rides for all ages available. With 50% off, have fun & cool down this mid-term! Aqua Park Qatar, the first ever theme park in Qatar is built on an area of 50,000 sq. meters of action-packed water fun. Featuring a mammoth play area, the giant 2,000-gallon tipping bucket, enormous 4 story high water slides, the full-sized wave pool, and a 200m long lazy river, the Aqua Park has all the ingredients that would allow you to set the tempo for your day out. Also available is a Toddler’s pool (aka African Village) and a Pirate area for children up to 12 years. Slide tower and wave-pool is also open for all. Munch on some great cuisine from Boston Fried Chicken or Grand Joud express, or quench your thirst at the Juice Bar then ease your way onto the lazy river around the park. 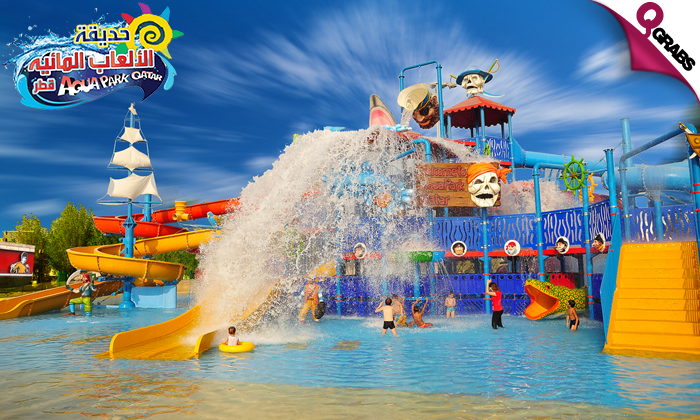 Opened its doors in October 2010, it has been serving the adventurers some great adrenaline packed splash-filled fun! The premier water themed park in Qatar is located opposite Abu Nakhla Petrol Station. It is approximately at a distance of 15 km from Industrial area ‘A’ roundabout. The Park’s attractive features are: Giant wave pool, lazy river, activity pool, multiple slides complex, family pool and special rides like Boomerang & Spaceboat.